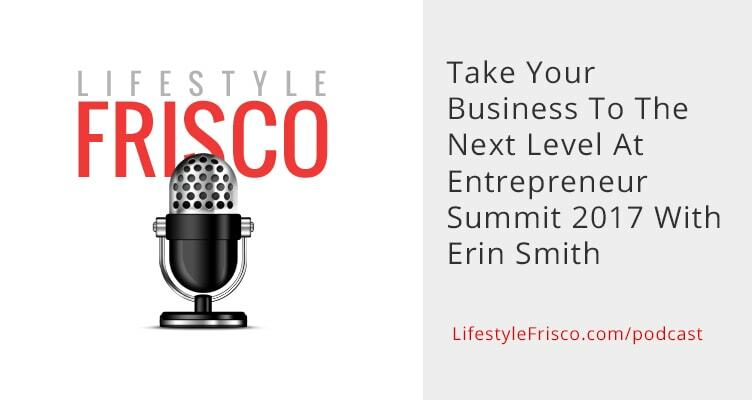 Scott Ellis: Welcome to the Frisco Podcast, I’m your host Scott Ellis and this week we are talking about the Entrepreneur Summit that is coming up in March. If you own a business and you are here in Frisco you don’t want to miss it. This episode of the Frisco Podcast is brought to you by Stands Main Street. If you’re out and about this weekend they should be at the top of your mind of places to stop in and have a bite to eat. It’s a very family friendly environment. They’ve got great burgers. They’ve got live music going on Thursday, Friday, Saturday night. Just a good place to go hang out, catch a bite to eat in the middle of the day, maybe at dinner time if you don’t feel like cooking. Stop in, tell them we said hi. Now, let’s get in to the episode. All right, Erin Smith is with us today. She is the founder and host of this fantastic event. Welcome to the show, first of all. Good to have you here. Erin Smith: Thank you so much for having me. Happy to be here. Scott Ellis: First of all, I want people to know you live in Frisco. So you’re based here. Scott Ellis: Your business is based here. Scott Ellis: We don’t get nearly enough of these kinds of events. These conferences and networking and learning opportunities in Frisco, so I get really pumped that you’re having it here. It’s at the convention center, right? Erin Smith: Yep, over at the Embassy Suites. Embassy Suites Hilton now is what they call it. But yeah, right at the convention center. Scott Ellis: Right now. Just so we get this right out there and people can start planning. What is the date? Erin Smith: March 30th is the date of the event and then on March 29th we’ve got some pre-conference events. We’ve got some intensives you can select from and a VIP happy hour. Scott Ellis: Okay awesome. We’ll get into all kinds of detail on that and we’ll link up everything you guys are going to hear about today in the show notes. So, this is year two. You did this for the first time last year. As somebody who’s done a few events I know how much work it is to pull one of these off, so congratulations on the new one. Scott Ellis: Now we’re going into year two and your going even bigger and better. Tell us a little bit about how things went last year, and then lets talk about what people can look forward to this year. Erin Smith: Yes, the reason why I started this event was because I was sick of, like to your point, we just don’t have enough of these events here. I was sick of flying all over the country to go to events that I wanted to go to when there was nothing in our backyard. We’ve got a great community here, but I just wanted fresh faces. I wanted different speakers. I wanted people who maybe we didn’t get a chance to see every day. It was one of those things like I’m just going to put my money where my mouth is. I’m not going to wait for someone else to do this, I’m going to do this. Several years ago I had gone to an event that Entrepreneur Magazine had put on and it just really, even being a seasoned entrepreneur I was in 10 years at that point, it really changed my perspective on things. It really changed just that whole you learn, you connect, and it was really great. That’s what I wanted to do. Just put something together to really bind the community here, meet different people, and I did it in 3 months. Last year was a little chaotic, although I don’t know if having more time has really helped me. Just this chaotic thing. I brought in speakers and my goal was two things: a) for content. I wanted people to walk out of that event with ideas, with a notebook full of things that they could implement into their business immediately. So how have other people done it, what are some new ideas they had that maybe they hadn’t thought of before. That was incredible. That was just such a great thing, because I just had people with notebooks, full of notebooks, going to the testimonial. Somebody said, “we needed more places to charge our phones because I was running out of battery on my phone because I was taking so many notes.” So that was great. The other side was business relationships. As someone who’s gone to a ton of networking events it’s so hit or miss. It’s so hit or miss. Sometimes you just meet people who you know really aren’t action takers they talk a big game, but they don’t do. I wanted people in that room who are action takers. Who, if you met, you could actually move forward with something. What I’m most proud of is out of that room last year, business partnerships were made. I actually just had feedback too from I mean one of my vendors there is about to close this massive deal with a person he met at the summit. That’s what makes me so proud and so happy and I just want game-changers in a room, who you can connect with each other, and do even bigger and better things in a combination. Scott Ellis: Yeah, no doubt. I think for me one of the biggest benefits of going to an event like this, and they’re not all created equal, but certainly Entrepreneur Summit was a very good one last year, is the networking, the relationships that you build. Speakers were phenomenal too. I don’t want to discount anything that we’ve learned there, because that is the draw to get you there. But half the time I go just because I want to connect with people. Erin Smith: Yeah, because you know that’s where there’s a line of the ticket price, because everybody wants it cheaper, but as someone who’s run events now for years I can tell you the higher the ticket price the more quality is in that room. You know the other people are willing to pay to grow themselves. It really does make a huge difference when you get in that right room of people. Scott Ellis: Yeah, no question. On that note, since we’re talking about ticket prices. What is it going to cost to go to the conference this year? I know there’s a couple of different tiers and things that people can do. So can you give us a quick breakdown on that? Erin Smith: Yeah. Early-bird actually is going to be ending January 15th. If you’ve purchased your tickets before January 15th you’re going to get $100 off. It’s only $149 for the whole day, that includes your lunch, so you get to stay right on the premise and everything is included in that. After the 15th it’s going to go up to $249. Then we have VIP options, so the night before we’re doing a VIP where we’re going to have some of our speakers there who are authors also. You’re going to get an advanced copy of their books, going to get a chance to meet them, and it’s just another tier of really meeting some great people. So we’ll be having that the night before. Then there’s also intensives, where it’s a 4 hour very small group around certain topics. We’re going to cover product launching, sales, digital branding, and productivity, like high performance. Really getting up in that 2%. Those will be additional that you can purchase with your ticket. Early-bird will be $70 and then we’ll be increasing those to $120 after the 15th also. Scott Ellis: Just so everybody out there got that. The early-bird ends on the 15th, this podcast is coming out on the 12th, so you’ve only got a few days from the time you’ve heard this if you did not already know about it to get that discount. I highly encourage you to go out and get that ticket now, because there is no travel involved, you don’t have to pay for a hotel, and for the caliber of people and speakers that are coming in it’s a great price. I have paid way, way, way more than that for conferences that were very good but didn’t necessarily have some of the speakers and some of the networking opportunities that you’re going to have at this conference. Just keep that in mind. It’s in your backyard people. Come on. Erin Smith: I would agree. It’s like a no-brainer. Scott Ellis: It really is. Let’s talk a little bit about some of those speakers and who you have coming out to teach us, to network with us, and hang out with Frisco folks. I really want Robert Herjavec at this event if there’s anybody I think of as an entrepreneur. A great guy, down to earth, but massively successful. It’s him. I’m so excited to meet him. If anything, I’m putting on a very expensive event just to meet Robert Herjavec, but whatever. I’m just very excited, the stars just all aligned to have him there. I knew I had to pull the trigger and bring him in. He is a huge entrepreneur, very successful, author, all those good things. He’s going to be kicking it off. Then we’ve got other great people coming in from, Amy Blankson is going to be closing it out. I’m really excited about her. Her and her brother, Shawn Achor, started GoodThink. You’ve probably known Shawn, he’s the happiness guy on Oprah. He’s been Oprah several different things. He’s got an Oprah course with her. Amy’s on the Oprah course. They really talk about happiness and how that aligns with production and productivity. She’s just about to launch a book. It’ll be right around the summit time. You’ll be getting an advanced copy of her book in VIP. It’s about how to be productive with all the technology out there. Very excited about that, because I think as entrepreneurs that’s one of the big things we struggle with. With more technology comes more distractions. How do you really utilize a technology to get the most out of it, but also to still be productive? It can be a catch-22 at times. Very excited to have her. Forbes Riley is going to be coming in for this. She’s the ultimate sales person and networker. If you just talk to her, it’s just so amazing talking to her. She was actually, you would recognized her from a lot of the HSN, the sales network. She’s done a lot of those infomercials. She was part of Jack LaLanne’s Juicer. Erin Smith: She’s going to be coming out to talk about, we call it the million dollar handshake. How do you really, as you’re networking with people, how do you stay top of mind. What are the things that you do and say that really create those deep relationships just versus “hi, what do you do? This is what I do.” Yada, yada, yada. Really optimizing our time. I’m going to be talking about gruff-hacking, like how do you use specific data along with market techniques to grow your business. We’re going to be talking about IOT, I’m working on the speaker, fingers crossed, we’ve got some e-mails going back and forth with a huge, huge, huge company to talk about that. IOT is one of these things that we are gathering so much data on people and so you as a business owner may think, well that doesn’t have anything to do with me, but it does. As we gather this data, how can you as a business owner no matter what you do, what industry you’re in, utilize that to build your business. It’s a really hot topic right now. It’s going to be in the billions of dollars of the industry within the next few years. And it’s something, no matter what you do you want to have your eye on and understand. I want to get the wheels turning of how you can utilize this in your business. Go ahead. Scott Ellis: I want to jump in here very briefly, because IOT is interesting. It’s still a little bit of a mystery to a lot of people especially if you have a bricks and mortar business and you’re not just embedded in digital the way you and I are. Just as a little teaser, we at Lifestyle Frisco, we are actually, we got a meeting next week with a company, and we are going to be coming back with an IOT plan for Frisco businesses. Something that we’re going to be doing through Lifestyle Frisco. Even if you just want to get your ticket to come out to the conference to learn more about IOT. I have no idea yet when we’re going to release this, but there are some cool things coming and this is really more for bricks and mortar businesses, what we’re going to be working on than it is for purely digital business. Now it’s all going to get tied together, but there is so much interesting potential there. I would think it would be worth it for people to come out just to learn more about that. It’s a chance to get ahead of the curve and that doesn’t happen too often. Erin Smith: That’s really exciting. I think too, I know for me it was a mystery. I don’t do any of that. It’s a real high-tech thing. It’s just not because we’re gathering all this data and I’ve got some good friends who are really involved in it, and we’re just brainstorming topics, and I said you know, because at first he was going to talk about just general IOT, I’m like no I just think that might turn other business owners still might not make that connection. What we’re doing is really making that connection, like what you said. Maybe you think it’s not for you, but it is, it can be. How do you really utilize even just the data, if you’re not going to create a wearable or whatever. I’m really excited about that topic and like I said, we’re going to have a big announcement hopefully shortly of who actually will be speaking on that one, because I’m very excited. We’re going to have a panel on financing. You’re at that point of growth, what do you do? Do you get a loan? If you need more money to get to that next level is the loan your answer? Is an investor your answer? We’re going to have different perspectives on that. How to get that funding to grow even more in your business. We’re going to talk about mindset. It’s another big one. Sometimes these may look fluffy, but it’s just not, because we know the tools a lot of times, we have the right people in place, we’ve got everything going, but our minds are our biggest enemy a lot of times as we’re building. I know for me, as an entrepreneur, it can be a very dark place very quickly if I don’t constantly work on that. Hoss Pratt, who he’s really had a lot of success in the real estate industry, he’s going to be talking about mindset and how to take it to that next level of growth. Everything is focused on growth. It’s really important to me. So you’re at this level, you’ve got a business, you’re growing, how do you get to that next level. Scott Ellis: Sounds like a lot of good speakers are going to be out at this event. I’m excited to hear that you’ve got some of these guys like Robert Herjavec and some of these others that are going to be out there. I’m very much looking forward to this. This is coming up on March 30th. So everybody go out and get your tickets. Early-bird ends on the 15th. We have sort of pre-event. How did you characterize those again? The day before sessions? Erin Smith: Pre-conference. Pre-conference events. We have intensives, like those sessions, and then like I said the VIP happy hour is going to be just a lot of fun. It’s not going to be a lot of people. We’re capping it. It’s going to be people who really care about their business, people you want to meet, and of course, like I said, you’re going to have opportunities to meet some of our speakers/authors and just talk a little bit more in depth with them before the event. Scott Ellis: Is there anything else that people should be maybe aware of. First of all, what’s the website? Where are they going to go to get all this stuff? Let’s start there. Erin Smith: That’s an important one, entrepreneursummitdallas.com. Erin Smith: See the agenda. Everything. Scott Ellis: And it’s going to be held at the Hilton Embassy Suites, which has historically been the Embassy Suites, Frisco Convention Center, right? Scott Ellis: Right there of off Gaylord? Erin Smith: I know, I always have to think about. Between Gaylord and Warren. But yes, Gaylord. Scott Ellis: And the conference itself is on March 30th. Erin Smith: March 30th, yes. Scott Ellis: Now, for anybody else that might want to get a little bit more involved. Sponsorships. Do you still have sponsorship opportunities available for people to take part? Erin Smith: Yes, we do have a couple of sponsorship opportunities open. If you go to entrepreneursummitdallas.com you can fill out a form. I will get back to you on the information. We’ve got several different levels. One thing that I’m really particular about when it comes to sponsorship is to create, what I like to call, win-win-win. Obviously the one win for us, right? The win for the sponsor in the sense of this goes way beyond the event. We do a lot of commercial, we’ve got social channels. I’ve got several social channels that I use, between my business of the Starter’s Club and the Entrepreneur Summit. Last year alone, this is what’s crazy on this, I’m really excited about this. Last year alone, on the day of the event, we had over 3 million social impressions on our hashtag. Erin Smith: We’ve go the social thing down. We’re really looking at optimizing that all outside the event. We do have a podcast that’s going to be launching, re-launching season two for this year’s set of speakers that you’ll have, depending on the level, you got access on that. Even an opportunity to have your own podcast to really promote your business. I know that worked really well for some of our sponsors last year. It’s way beyond just having a booth at the event. We really try to push this. The third win is for our participants, because our attendees, because I don’t want people there that really have nothing to do, we’re focused with helping our attendees. We’re focused on growth. We want businesses there who help entrepreneurs grow, and by being able to meet them at the event, it’s just like I said a win-win for everybody. Scott Ellis: Yeah, it’s a fantastic opportunity to get involved. I think you’ve got more information about that on the website as well. Scott Ellis: If you want to be a sponsor reach out to Erin. Go hit entrepreneursummitdallas.com and again hit that event up for your tickets. It is coming up on March 30th and that’s going to be here before you know it. You know how fast 2016 went. Erin Smith: Oh my gosh, I can’t believe we’re in 2017. It’s crazy. Scott Ellis: Yup, here we go. All right, Erin thank you so much for the time today. We really appreciate it. I hope we get to see a whole bunch of Frisco businesses out there. So much growth happening in this city. There’s so many businesses of all sizes that are starting here, and coming here. It’s a great chance to get together with a whole bunch of your contemporaries. Of course there will be people there aren’t necessarily from Frisco, but this is happening in the backyard. Erin Smith: What’s crazy is we’ve got people flying in. I’ve got people from Boston on the agenda, Oklahoma, Florida. We’ve got a whole range, so you’re not just going to be meeting people in your backyard, you’re going to have the opportunity to really shake hands with entrepreneurs from all over. Scott Ellis: Love it. Love it. Well thank you for putting in the work. Thank you for stepping up and making this happen. Erin Smith: Thank you for having me on today. Fingers crossed this turns out like we hope, because I’m excited about it and I feel a need in our community and like you said it’s just right in our backyard. Scott Ellis: Yeah, it’s good to have it here. So, Erin thanks again. I appreciate you joining us. The rest of you, thanks for tuning in and we will talk to you next week on the Frisco podcast.